As mummy to 7-year old Ella, surrogate to far too many pets and with a failed marriage under her belt, Mavis knows she needs to make some life-changing decisions. It's time to strike out into the world, to stand on her own two feet … to pursue a lifelong ambition to become a Police Officer. I mean, what could go wrong? Supported by her quirky, malapropism-suffering mum, Mavis throws herself headlong into a world of uncertainty, self-discovery, fearless escapades, laughter and extra-large knickers. And using her newly discovered investigative skills, she reluctantly embarks on a search to find her errant dad who was last seen years before, making off with her mum's much needed coupon for a fabulous foam cup bra all the way from America. Follow Mavis as she tackles everything life can throw at her, and revel in Gina Kirkham's humorous, poignant and moving story of an everyday girl who one day followed a dream. Gina was born during the not-so-swinging 50’s to a mum who frequently abandoned her in a pram outside Woolworths and a dad who, after two pints of beer, could play a mean Boogie Woogie on the piano in the front room of their 3-bed semi on the Wirral. Being the less adventurous of three children, she remains there to this day – apart from a long weekend in Bognor Regis in 1982. Her teenage years were filled with angst, a CSE in Arithmetic, pimples, PLJ juice, Barry White and rather large knickers until she suddenly and mysteriously slimmed down in her twenties. Marriage and motherhood ensued, quickly followed by divorce in her early thirties and a desperate need for a career and some form of financial support for herself and her daughter. Trundling a bicycle along a leafy path one wintry day, a lifelong passion to be a police officer gave her simultaneously an epiphany and fond memories of her favourite author Enid Blyton and moments of solving mysteries. And thus began an enjoyable and fulfilling career with Merseyside Police. On reaching an age most women lie about, she quickly adapted to retirement by utilising her policing skills to chase after two granddaughters, two dogs and one previously used, but still in excellent condition, husband. Having said goodbye to what had been a huge part of her life, she suddenly had another wonderful epiphany. This time it was to put pen to paper to write a book based on her experiences as a police officer. If you are looking for a book to make you laugh out loud then look no further!! 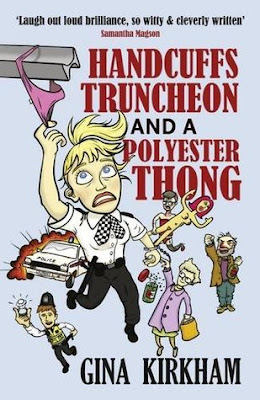 Mavis Upton is a wonderfully real character and her exploits as a single mum and as a rookie police officer will keep you entertained throughout! I was in need of a lighter book after some recent darker reads, and this was the perfect antidote! The world needs more funny books!! From her challenges in motherhood, to dealing with her own mother, dating colleagues and going for a career change as a police officer this book takes you through such a range of emotions! I was in fits of laughter one minute, and then shedding tears the next! Every aspect of her police training is explored and many moments had you thinking they were more like the keystone cops! She isn't the only quirky character featured and this adds to the fun, but the author even explores the darker side of police work with the reality of the sights they are often called out too that are tough for them to deal with - and then you understand why they need their often twisted sense of humour to get them through! Mavis is such a delightful character - full of flaws but so determined, plucky and real! The humour mixes well with the more tender, emotional moments and I'm delighted to hear the author is already working on another book featuring this character! I can't wait!! !